Is Sansar the name of the Lab’s new virtual experiences platform? For the last several days, speculation has been circulating on whether the name SANSAR might be the name of the Lab’s new next generation platform for virtual experiences. In addition, in October 2014, Ascio Technologies, Inc., filed a domain name registration for projectsansar.com listing Linden Research as the Domain Administrator. 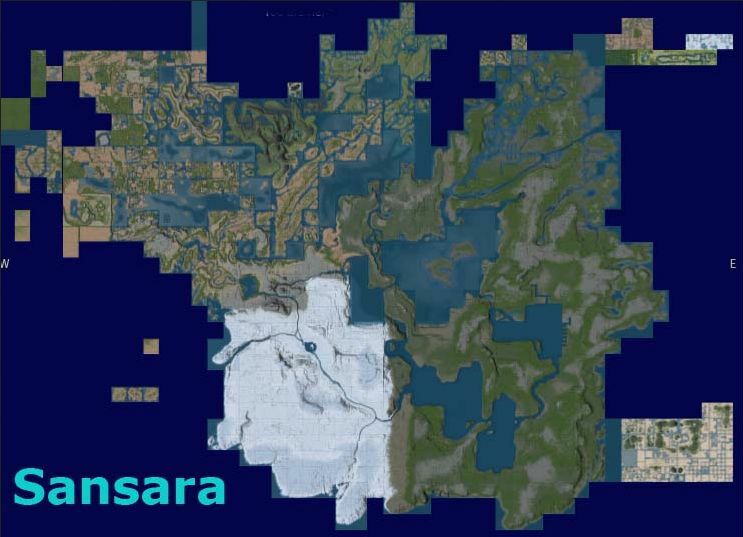 As has already been indicated in some of the responses to the forum posts referring to the trademarks, Sansara was one of the early names considered for Second life (being derived from Samsāra, which occurs in both Buddhism and Hinduism, and, perhaps more particularly where SL is concerned, was used by Hermann Hesse in his 1922 novel Siddhartha as a reference to the “world of illusion”), and currently lives on as the name of SL ‘s oldest and largest mainland continent. Whether “SANSAR” is a play on this is unclear – it might just as easily be an acronym. Entertainment software, namely, software that is used for providing multi-player access to an on-line game environment; computer game software; virtual reality game software; computer graphics software; software that is used for providing multi-user access to an online 3D virtual environment; computer 3D virtual environment software, namely, software for use in creating, manipulating and participating in 3D virtual environments. Advertising and marketing services, namely, developing and distributing electronic marketing materials. Online financial services, namely, offering a fictional-dollar-denominated credit card to charge online purchases. Communication services in the nature of text messaging and electronic mail services used in playing on-line computer games; communication services in the nature of text messaging and electronic mail services used in an online virtual environment. Entertainment services, namely, providing an on-line computer game by means of communications networks; entertainment services in the nature of providing an on-line multi-player electronic computer game; entertainment services, namely, providing an on-line computer game that may be accessed by means of communications networks. Computer services, namely, hosting an on-line 3D virtual environment featuring a wide variety of user-defined subject matter and hosting an on-line 3D virtual environment featuring a wide variety of user-defined subject matter that may be accessed by means of communications networks; design and development of multimedia and three dimensional virtual environment software. Most of this reads pretty much as description for Second Life – so the applicability for a new virtual experiences platform is fairly obvious, and hence the speculation that is circulating. However, what really does pique interest in this description – beyond whether or not it pertains to the Lab’s new platform – is not the description of the environment, but the description of “online financial services”. The Lab has already indicated that Linden Dollars would be supported on the new platform, however, the description of a fictional-dollar-denominated credit card to charge online purchases suggests a new mechanism by which good and services within the new platform can be purchased, and by which the Lab might generate revenue. Whether the name reflects the actual name for the Lab’s new virtual experiences platform or purely an interim project name (or even both, as may be the case given the two trademarks), is unclear. Sansar itself is a popular name for organisations related to the Asian continent (including SANSAR, the South Asian Network Supporting Awareness and Research based in Canada), so brand recognition, if this is to be the name, might be interesting in some quarters. I approached Linden Lab for a comment on the matter, but have yet to receive a reply. Should one be forthcoming, I’ll update this article. Next Post Firestorm 4.7.1 Beta: It’s here! Sorry but with a name like that it seems impossible they would commit such a folly. Remember Ebbe has already stated they have an internal project name that they did not want public. for fear it would be mistaken for the projects true final name. They did not have to create a name.it could have already long been owned by them like the trademark Creative Spaces or they have agreed to buy a trademarked name from another business. you could also go so far as speculation that one of the investors of linden lab is sitting on it. or even Philip Rosedale owns it! and is just holding it to keep it away from the spying type. I think its just impossible! they would use such an uninspiring name to draw in the amount of people they have set target numbers for. but the name sounds good for a motor oil brand or a generic television manufacture. it has no flair or peeks curiosity for virtual world tourist. At the end of the day it might just be for another project.one that will be more of a business to business project unrelated to current virtual worlds development. The software could be Sansar but the actual “game name” could be something zippier and still under wraps. Do like that it sounded like prepaid gift cards maybe offered. FYI: In Buddhism, Samsara does not really refer to the ‘world of illusions,’ but rather just means ‘The Wheel,’ referring to the continuous process of being reborn (reincarnation). Actually, I didn’t say Samsara did refer to the world of illusions. I said the term “Sansara” is used by Herman Hesse in his 1922 novel Siddhartha as a reference to the “world of illusion”. Didn’t say you did. 🙂 Just a FYI, to show that the relationship between Sansara and a ‘world of ilusions’, when pencil came to push, is less strong than LL may have hoped for. Personally, btw, I don’t care what they call it, as long as it’s available. Streaming SL was a welcome addition, and I was saddened to see it (SL) go. – the domain-registration is from 2014/Oct. the virtual currency trading is since ages a matter of headaches. So why not to spin off this part of business? You split off the risk as well and have a wonderful opportunity to to settle internal costs. Beside that one could use such spin off in general for other activities(haven't said SL2 here) easily. Domain registration is, on the scale of Linden Lab, dirt cheap. Even if you’re working through a rather expensive business service.